Guess it and win Giveaway! Nintendo Direct Recap: Crossovers, Zelda, and More! Winter Spectacular 2.0 – Day Seven: Winner’s Choice! Winter Spectacular 2.0 – Day Six: Win Hitman Absolution! Winter Spectacular 2.0 – Day Five: Win XCOM Enemy Unknown! Winter Spectacular 2.0 – Day Four: Win Dishonored! Winter Spectacular 2.0 – Day Three: Win Far Cry 3! Winter Spectacular 2.0 – Day Two: Win The Walking Dead The Game! Winter Spectacular 2.0 – Day One: Win Kingdom Hearts 3D! Who Had The Strongest Showing At E3? Chris Poirier on Did You Miss Us? Ryan H on Did You Miss Us? Ryan Hancock on Did You Miss Us? @GameSplash: I want an #Arma3Lite code! First 3 to RT and follow @gamesplash and @thegamerscene get to play right now! @GameSplash: We've teamed up with the fine folks at @TheGamerScene and @bohemiainteract to give out Arma 3 Alpha Lite Codes all weekend! @GameSplash: The Xbox One is now official! What are your thoughts on Microsoft's new next-gen console? @GameSplash: We're about to announce our Bioshock: Infinite winner! Was it you? Check out our Facebook page to find out! @GameSplash: Watch for our Battleblock Theater review by the end of the day today! @GameSplash: GameSplash will be down for the next few hours for maintenance. Thanks for your patience! @GameSplash: Pikmin 3 gets a release date, Earthbound is coming to VC, A Link to the Past is getting a sequel... Whew! @GameSplash: Mark your Calendars, regular site updates resume next Friday, April 12! Above is a heavily obfuscated screenshot from a mystery game. Do you know what this game is? 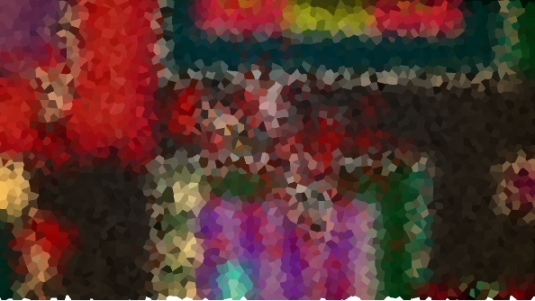 If so, prove it - simply guess the game in the screenshot, and submit your guess to contest(at)gamesplash.net. First correct answer wins a steam code for the mystery title! If you get stuck, watch our facebook page over the course of the next week for clues. Entries will be accepted until 11:59pm EST on June 28, 2013 - or whenever the game is correctly guessed, whichever comes first. In the rare event that multiple correct entries are received at the same time, winner will be determined by random draw. Update: We have a winner! Congratulations to Leon Durham, first one to correctly identify the mystery game as Hotline Miami.